This is Marion 204-M Superfront cable-operated mining shovel, and it’s massive. First built in 1974 by the Marion Power Shovel Company (who also built NASA’s enormous crawler transporters), the 204-M Superfront used electrically driven cables to drive its huge bucket arm and had a working weight in excess of 700 tons. Built for around twelve years the 204-M worked in open mines all over the world, with the last still operating in Asia decades later. This incredible fully functioning Lego replica of the Marion 204-M Superfront was discovered by one of our Elves on Flickr and it comes from Beat Felber who has recreated the machine in astonishing detail. Powered by eight Power Functions motors and controlled via bluetooth thanks to three third-party SBricks, Beat’s 204-M Superfront uses an XL Motor to drive each track whilst two L Motors can slew the entire superstructure independently. A pair of XL Motors power each of the cable drums and the bucket angle and bucket door are electronically powered by another two motors, giving Beat’s model as much articulation as the real Marion 204-M.
There’s a whole lot more to see of this spectacular model at Beat Felber’s Marion 204-M Superfront Flickr album, plus you can read our 5 star review of the SBrick bluetooth controller that makes creations like this possible by clicking here. There’s something massive at TLCB Towers today. No, it’s not your Mom (she left this morning), but this, an absolutely gargantuan Caterpillar 797F mining truck built from 61,399 LEGO bricks! Designed by Certified LEGO Professional Ryan McNaught for the previously featured ‘Brickman Awesome’ show, the Lego 797F utilised Caterpillar’s own 3D modelling tool in its creation and took Ryan and a fellow builder 53 hours to construct. There’s a whole lot more to see of this astonishing build (just look at those brick-built wheels!) at Ryan’s photostream, where you can also see the other models from the Brickman Awesome show, many of which have appeared here. Click the link above to make the jump! It’s tough being a TLCB Elf at times. After being squashed on several occasions by colleagues’ remote control finds one of the Elves finally got itself an RC model to exact some revenge and then found it was too slow to do any squashing at all. Worse still, its targets jumped in the back for a free ride. Fortunately this amazing Caterpillar 797F mining truck (one of the largest in the world in fact) by Sheo features more than just remotely controlled drive and steering. All-wheel suspension and folding ladders are present too, but they’re of no use to a vengeful Elf. What was useful was the enormous fully mechanised dumping bucket, operable remotely via twin linear actuators. This meant the inventive Elf could drive its free-riding colleagues out into the snow that’s currently surrounding TLCB Towers and tip them neatly into a snow drift. Revenge exacted. We now have one very happy Elf, and several very cold ones. No matter, there’s more to see of Sheo’s excellent Caterpillar 797F on Flickr and at the Eurobricks forum, which includes a video demonstrating the model’s features. Click the links to take a dump. Our Elven workforce couldn’t resist this nicely detailed mining lorry from Flickr’s LEGO 7. As well the detailing, the “Giant Dump Truck” has some nice play features, including an opening cab & tipping function. Depending on how you choose to read its name, it could also be a bit rude. Perfect for our Elves and sadly perfect for us too. Click the link in the text for more photos. The Lego Car Blog Elves have had a Good Day today. Firstly, the last four models to be blogged here have been yellow, and the Elves love yellow. Secondly, this was the fourth of them; built by Beat Felber and following on from his huge LeTourneau L-1200 front loader blogged here earlier in the week, it’s a truly humungous Euclid R-170 mining truck, and like the LeTourneau it’s fully remote controlled. Driven by a single Power Functions XL motor, with Servo-motor articulated steering and a dumping bucket powered by twin linear actuators, the Euclid can be controlled remotely via a Bluetooth device thanks to a third party SBrick. As is usual for this type of creation, the Elf that found it tried use it to smush his colleagues into the office carpet, but thankfully for our cleaners – who have to try to remove Elven blood and sick on a regular basis – the Euclid is pretty slow, and the Elves finally seem to be wising up to the constant threat of impending smushery. Happily therefore, rather than being squashed a whole hoard of them are merrily riding around in the back, which looks tremendous fun until the Elf at the controls figures out how to operate the dumping mechanism. Until then we’ll enjoy the merriment and you can check out more of this amazing machine, and the matching LeTourneau L-1200 loader that accompanies it, by clicking here. We were a bit underwhelmed by LEGO’s 42049 Technic Mine Loader set when we previewed it here towards the end of last year. It has pneumatics and a two cylinder engine, but…meh. However a recent upload by previous bloggee Tamas Juhasz (aka mbmc137) shows how it should have been done, and at about half the scale. With all the functionality of 42049, Tamas’ build squeezes in all-wheel-drive, articulated steering, pneumatic bucket elevation and tilt, and a two-cylinder piston engine (making it just as unrealistically underpowered as LEGO’s version). 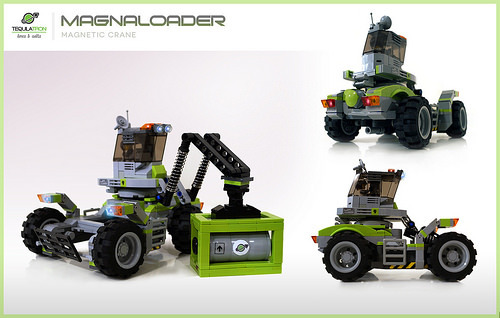 There’s lots more to see of this incredibly tidy build at Tamas’ Brickshelf gallery and at the Eurobricks discussion forum, plus there’s a video of the loader’s features available below. Most of the sets I buy now happen after months of deliberation, intense community scrutinization, and reading every online review I can find. And usually during double VIP months at LEGO.com. Not this one. I went to the local toy store in a moment of children-induced weakness, purchased this cute little dump truck, and went home and started building it right away. The box of 42035 is smallish, but the weight of it conveys a $30 set more than the size does. Upon opening the box, you’ll find a couple of bags of parts, a small sticker sheet, and wrapped instructions for both the A and B model. As I started sorting the contents I found some of the new or rare parts that attracted me to the set. First, the new panels are pretty fun. Basically, they are a 5×11 panel with a 9×2 triangle removed. They are robust, and have an empty center; both sides of the panel are flat and can be presented to the outside of a model. Second, are the newish tires. They were part of the reason I was interested in this set, as I wanted to try them out in some MOCs, as their size fills a nice hole in Technic wheels range. Third, there are a smattering of new unique and/or interesting parts, like a piston and cylinder and the 3L pin with 1L axle. At over 1.2 meters longs, weighing 8kgs, and with 14 motors, 4 batteries, and 6 IR receivers, Desert752 Kirill’s replica of the 700 ton soviet ER-1250 bucket wheel excavator is one of the most spectacular creations that this blog has ever featured. It’s also, if you’re a TLCB Elf, one of the most dangerous. Four XL Power Functions motors power the excavator’s two tracks independently whilst two M motors can swing the platform through 360 degrees. Another two M motors rotate the conveyor unloading arm so that it can remain at a fixed point whilst the superstructure turns around it, a third M motor powers the conveyor belt, and a fourth controls the arm’s height. An L motor performs this role for the main boom, with a further M motor powering the bucket wheel on the end. Finally two micro-motors control the unloading mechanism. Now imagine that you are a TLCB Elf. An Elf who has been squashed several times during employment at TLCB Towers, and who has gleefully discovered this particular creation. You can probably guess the outcome when an 8kg remote control tank complete with a viciously rotating bucket is under the control of a bitter and vengeful mythical creature. It’s safe to say that we have a lot of tidying up to do this afternoon. I Like Tequilatron, It Makes Me Happy! Graphic designer, Pico van Grootveld is the design and editing brains behind a sci-fi collaboration called “Mining Frenzy“. We featured one the builds, Clayton Marchetti’s “Goliath” on our rather spacey Sunday. Pico’s contribution to the collaboration was a ship from his Tequilatron faction but he also built some other vehicles, which didn’t find space on the poster. 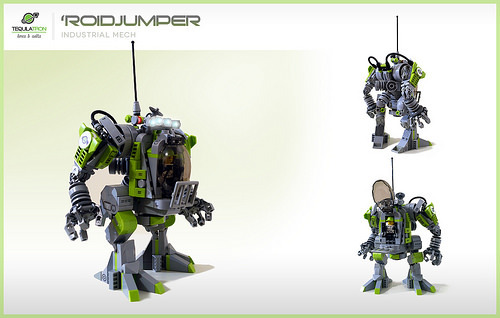 At the top of this post is his Magnaloader and below is the ‘Roidjumper Mech. Pour yourself a drink and then sit back and click this link to enjoy Pico’s work.